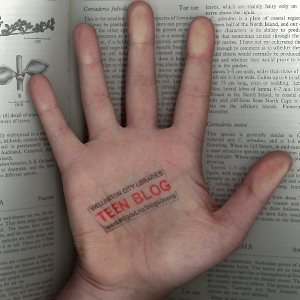 Recently on the teen blog we highlighted some of the upcoming new books you can expect to see this year. I said I’d be back with catalogue links so that you could place some reserves for your favourites, and, diligently (and hopefully correctly) I’ve put them into the post now. So you can reserve away. More will be ordered in due course. Good news for Gleeks, Glee : The Music, Volume 2 has arrived amongst our collection. You won’t be able to find it on the shelves though, because lots of you have already reserved it. Jump in the queue and excitedly wait for the most popular music since 1964 – true story, in 2009 the Glee cast had 25 singles in the Billboard hot 100, the most since the Beatles had 31 back then. Just as big really. Nirvana’s albums are almost all too old to have a Young Adult card now, and Bleach recently turned 20. To celebrate this occasion, Sub Pop has released Bleach (20th Anniversary Edition). More than just the standard reissued, same old album, but with a new booklet and a couple of token bonus tracks, this one has an entire live concert packaged with it. One that could be rightly considered deserving of a stand alone release. Worthy! Another nicely packaged package is Live from the Royal Albert Hall by The Killers. You get a career spanning concert performance + behind the scenes doco on the DVD side and an 80 minute chunk of said concert performance on the CD side. No matter where you are you can pretend you’re at a concert! All in all it’s a killer collection, haha. And if you’d like to hear previews of these CDs they’re all on our bebo page. Wellington City Council is running a photography competition for 10-18 year-olds in March. You can win a camera, and maybe even get paid for your photos to be added to the Council’s collection of stock images. Paid! Win! Two appealing words. All you need to do is take photos that captures your youthperspective of Wellington. It runs from Saturday, the 13th of February, to Sunday, the 14th of March. There is a free photography workshop on Saturday, the 13th of February , here, at the Central Library, at 1pm. There is more information to be found here. Hi! Here are this week’s new books. Watching Jimmy, by Nancy Hartry (152 pages) – Carolyn’s best friend, Jimmy, is assaulted by his uncle, and is left with brain damage. The uncle tells everyone that Jimmy fell from a swing, but Carolyn knows the truth. She must protect Jimmy from his uncle and also try to raise some funds for Jimmy’s brain surgery. Perfect You, by Elizabeth Scott (282 pages) – Kate is forced to work with her dad, who has quit his job to sell vitamins in a mall. Her best friend’s new-found popularity means she now ignores Kate, and she doesn’t know how to react when the gorgeous Will shows an interest in her. SO. She tries to stop caring about anyone or anything, which is never a good idea is it? No. How to Say Goodbye in Robot, by Natalie Standiford (276 pages) – Bea moves to a new town and makes friends with Jonah, a ‘quiet observer’, rather than one of the ‘very cheery, very friendly, very average’ girls she meets on the first day. Jonah’s and Bea’s friendship is intense to say the least. Also they have a thing for Iceland, my favourite country! The Dark Divine, by Bree Despain (372 pages) – A supernatural Christian romance (the first, maybe?) about the daughter of a pastor, Grace Divine, and the apple of her eye, Daniel Kalbi, who comes from a line of demon-hunting werewolves. Captivate, by Carrie Jones (276 pages) – The sequel to Need, which is about pixes and werewolves. Pixes and werewolves! Captivate adds valkyries to the mix. Might also be a supernatural romance? Wish You Were Dead, by Todd Strasser (236 pages) – An anonymous blogger wishes the school’s most popularist girl was dead, and the next day she disappears. Her friend, Madison, begins to receive notes that say she’s next; she turns to mysterious new student Tyler for assistance with the mystery. Heroes of the Valley, by Jonathan Stroud (389 pages) – Epic fantasy set in an enormous valley, which was once a wild place besieged by bloodthirsty Trows. Now that it’s much calmer, Halli pines for the olden days of legendary heroes. A chance to go on a daring quest unites him with Aud, a girl as headstrong and reckless as he is. Fallen, by Lauren Kate (452 pages) – This book has loads of reserves on it! It looks to be a supernatural romance (a la Twilight etc.) about a girl named Luce, who goes to a new school and meets Daniel, to whom she is irrestibly attracted. He is an angel btw and things get complex. Libba Bray has won the 2010 Michael Printz Award for her book Going Bovine, about Cameron, a sixteen year old with Mad Cow disease and who goes on a road trip with a gaming dwarf. As I mentioned in an earlier post, this is such a strange story idea that it’s just begging to be read. If you want to find out more about award winning books, visit this post. So many new books, not so much with the new CDs. Because you must be hanging out for some music by now, I, Synthesiser Patel, would like to share with you my new favourite song. We’ve had loads of new books lately. Here are more! Shadowland : The Immortals, by Alyson Noel (339 pages) – This is the third book in The Immortals series. Ever and Damen have lived through many past lives to be together, but a curse inteferes with their long-awaited destiny. Damen ends up in the Shadowland, and Ever meets a magickal surfer named Jude. Suzi Clue : The Prom Queen Curse, by Michelle Kehm (309 pages) – Suzi Clue solves mysteries, is fifteen, ‘fiesty and fabulous’. As the prom queens fall prey to various mishaps, and the prom is threatened with cancellation, Suzi decides the only way to find out what’s happening is by running for prom queen herself. VIP Lounge : A Chole Gamble Novel, by Ed Decter and Laura J. Burns (339 pages) – Chloe Gamble is the hottest thing in Hollywood. She’s a film star and a music sensation, and people around her want in on her money and fame, I guess? The second book in a series! The Van Alen Legacy : A Blue Bloods Novel, by Melissa de la Cruz (369 pages) – This is the fourth Blue Bloods book, and continues the story of rich Upper East Side vampires. The Secret Life of Prince Charming, by Deb Caletti (322 pages) – All the women in Quinn’s life have had their hearts broken at some stage, and after she herself is dumped, she starts to think that there are no good men. When her no-good father turns up she decides to take the bull by its horns and right her father’s numerous wrongs. Gifted : Better Late Than Never, by Marilyn Kaye (215 pages) and Gifted : Here Today, Gone Tomorrow, also by Marilyn Kaye (213 pages) – Books 2 & 3 in the Gifted series, about nine teenagers who are gifted and can read minds, or see into the future, and so forth. Sonya Hartnett, Butterfly. Her first book, Trouble All the Way, was published when she was 15. Christopher Paolini, Brisingr. I picked Brisingr because of the dragony bits which were cool. He was 19 when Eragon was published. Kenneth Oppel, Starclimber. Although his first published book was Colin’s Fantastic Video Adventure (he was 18). He got it published via a family friend called Roald Dahl. S E Hinton, The Outsiders. S E Hinton was 17 when she published The Outsiders in 1967. Amelia Atwater-Rhodes, In the Forests of the Night. She was just 14. Flavia Bujor, The Prophecy of the Gems. Flavia Bujor finished her first novel when she was 12 and it was published two years later. Alexandra Adornetto, The Shadow Thief. An Australian author, Alexandra Adornetto was 15 when her first book was published in 2007. Since then she has completed the trilogy. Ned Vizzini, Be More Chill. Although he was a whopping 23 years old when Be More Chill was published, Ned Vizzini wrote as a columnist for the New York Press when he was a teenager. Mary Shelley, Frankenstein. Mary Shelley was a married woman of 18 when she wrote Frankenstein and it was eventually published when she was 21, but things took longer back then. The story goes that Mary, Percy Bysshe (her husband) and Lord Byron were sitting around the fire one day when it was decided that they should have a competition to see who could write the best supernatural story. Guess who won? Anne Frank, The Diary of a Young Girl. Anne Frank of course died in Auschwitz aged 15. Congratulations to Bronwyn for winning the 2009 Short Short Story competition with her story ‘A Decision Between Two Hands’. Well done. Bronwyn wins the Cirque du Freak prize pack – enjoy! Read a children’s book from 1972 (the olden days) which attempted to depict what life would be like in 2010. Which is the year we’re in now, as you are aware! It gets a few thing right, although the robot arm that throws you your toast and the jumpsuits everyone wears are a bit of a stretch.